Our company's name is an acronym of World Electronics Corporation. 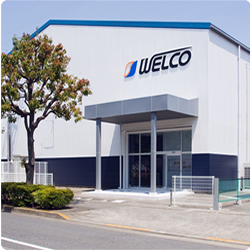 Yukio Kon named his company WELCO when he established it in 1971,hoping that the company would be unique around the world with its electronics products. We have been offering products in various fields for more than 20 years since WELCO's establishment as a manufacturer of industrial electronics equipment, including multiplex transmission systems. Since then, we have newly developed and started to offer peristaltic pumps and chemical dispensers (in 1991) in response to our customer needs. Peristaltic pumps are now our flagship products, and have a high reputation for good performance and reliability in a wide variety of areas such as medical care, analysis, printing, washing,and industrial machines.